CONTROL ROOM is a feature film project from the award-winning team of Ben Phelps and Gabriel Dowrick. Between them they have won over 60 major awards and numerous accolades for their films, TV series, commercials and branded content. Their work has screened internationally in cinemas, TV, online and in over 200 prestigious film festivals from Berlin to Brisbane, Montreal to Melbourne, Seattle to Sydney, Tampere to Tropfest. The screenplay for CONTROL ROOM was a finalist in the acclaimed international competition, Script Pipeline. Here’s a 2-minute teaser. If you like this sizzle reel, you’ll love the film we want to make! Two female operatives – an idealistic analyst and a jaded ex-spy – have to cooperate to stop an attack, but they’ll have to do it all from the confines of a high-tech operations room that’s hidden within a restaurant. We’re excited about this script because we love espionage thrillers and political dramas – two genres that are rarely written in Australia. In the tradition of low budget features, most of our story is set in a single location. A covert surveillance unit, called ‘The Hive’, has set up a nerve centre in a Chinese restaurant to monitor a G20 motorcade. 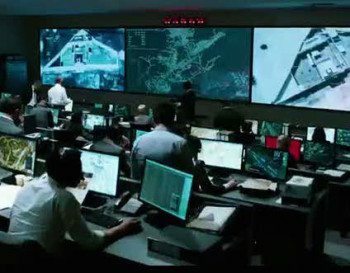 Their only view to the outside world is via a wall of TV screens that depict the perspective of a lone field agent and a myriad of cameras across Hong Kong – CCTV, GoPros, drones and civilian smartphones. This component of their investigation will effectively take the form of another established, low budget technique – ‘found footage’. High concept, low budget. Given that most of the film is set within the pressure cooker atmosphere of ‘The Hive’, we’ll be relying on experienced and charismatic actors to convey the escalating conflict as the clock ticks down. From a casting perspective, we’re excited about a film that’s led by two, strong female characters. By pitting an older female actor against an emerging female actor of a younger generation, CONTROL ROOM will be a refreshing entry in international genre cinema. These characters aren’t simply wives or girlfriends. To the contrary, they totally drive the story. Like Ben’s short films, CONTROL ROOM will be underpinned by a contemporary political theme. In this case, a universal dilemma faced by all global intelligence agencies: ‘Does the end justify the means?’ We can’t wait to take the step and bring this story to life! I’m an award-winning Writer and Director from Sydney, Australia. My passion for movies was ignited when I worked at an arthouse cinema while studying filmmaking and law at university. I’ve worked in the media industry for more than 10 years, writing screenplays, directing short films and producing branded online content. Specialising in the Drama/Thriller genre, my films are underpinned by contemporary cultural themes that reflect my immediate environment. Anticipating the community tension that led to the infamous Cronulla riots in Sydney, my film CHECKPOINT (funded by Screen NSW) depicted an emotional encounter between a Lebanese-Australian family and a group of hostile soldiers. I continued to explore Australian race relations with NICE SHOOTIN’ COWBOY (funded by Screen Australia), a portrayal about the complexity of racial identity from the perspective of an Aboriginal teenage father. My films have resonated with global audiences, garnering more than 20 awards and been selected for Official Competition in 100 international festivals, including 40 Academy Awards accredited festivals. Highlights include major prizes in Australia, USA, Canada, France, Italy, Spain and Russia. CHECKPOINT won the Jury Prize at Montreal Film Festival and a Dendy Award at Sydney Film Festival. NICE SHOOTIN’ COWBOY became one of only 80 films eligible for the Oscars after winning Best Short Film at Austin Film Festival. Check out the full list of Awards and Festivals. Both films were picked up for international distribution by Flickerfest and Arenafilm for broadcast in 6 countries, including SBS TV in Australia. I’m also an alumnus of the competitive creative lab, Accelerator, at Melbourne International Film Festival.